On Thursday at the NDF courts, the Poly Blues were beaten by two points in a match where the NDF Carabinieri introduced themselves to their opponent with Oscar Chibas as their newly appointed Head Coach. The Clear Essence Katutura Titans followed NDF Carabinieri footsteps beating Daan Gerretsen's Poly Blues. Clear Essence Titans' Adeyemi A led all scorers with 23 points followed by his captain Corbin P with 17 points. 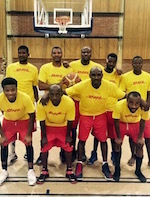 On Poly Blues' side, Didier N scored 20 points followed by Glen da Silva (BD) with 17 points and Martin F with 16 points. The Tomahawks MBA have confirmed their 6-0 Winning streak after beating Oscar's NDF Carabinieri. Tomahawks' Luis Almeida, the league's most dominant forward violently dunked over the NDF captain Jonas S (Shasha) but Paulus P immediatly returned the favour in a fastbreak dunk to shorten the difference back to 5 points. Not happy with the reply, the Tomahawks still put down 4 more dunks that the Carabinieri squad could not retribute. L Murere led all scorers with 29 points, followed by Paulo Cassanga with 28 and obviously L Almeida with 25 points. On the NDF side, Paulus P scored 24 points followed by the MAN OF THE MATCH, S Justice with 23 points (of which 5 where 3 pts).